Do you know a child in early elementary school who would love a story about a Tripawd dog? If so, enter to win a copy of a new children book’s book about a three-legged hero, Trouper. 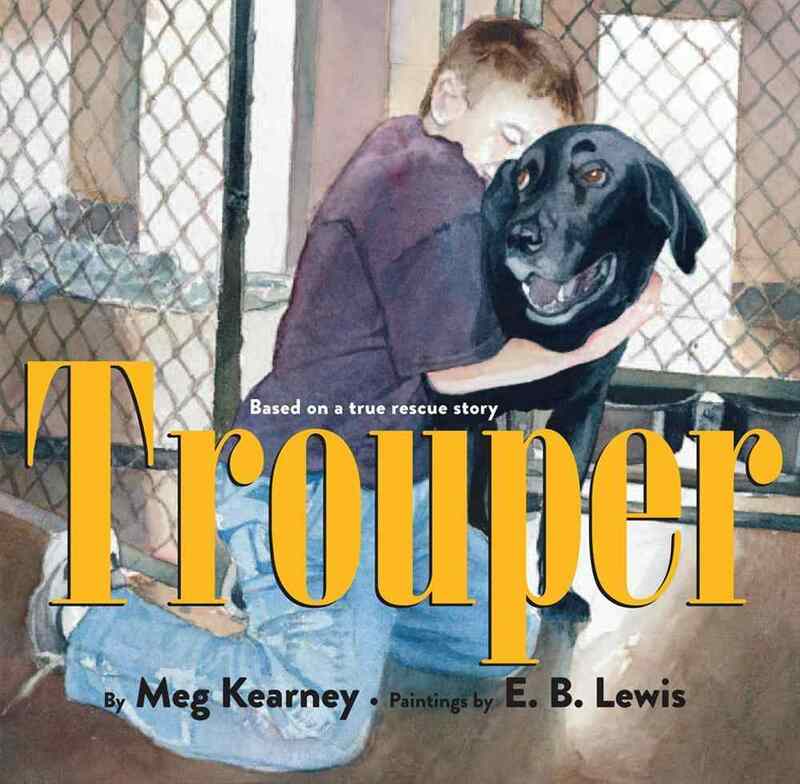 Trouper is a kid-friendly story about a three-legged stray dog who roamed the streets with a mob of other homeless dogs until one fateful day this roving gang was rounded up and sent to an animal shelter. Written by Meg Kearney and beautifully illustrated by E.B. Lewis, children learn how Trouper finally meets the right boy who instantly knows this three-legged mutt is going to be his best friend. This book will touch the heart of everyone who reads it but especially those of us who know the special joys of having a three-legged animal in the family. Read our complete review here in the Tripawds Amazon Blog. You can WIN this adorable book just by telling us a little something about the dog, cat or other animal who left a pawsitive impression on you when you were a young child. This contest runs from today until next Friday, January 17 at 11:59 pm Pacific time. Previous winners of Tripawds contests within the past 60 days are not eligible for entry. One day when I was about 12 I opened the back door to find a small black cat on our patio. She instantly froze and stared at me. I took a small step forward and said “here kitty”…that was all it took for her to come up to me and start meowing, rubbing herself on my legs, and nudging my hand with her head. It was love at first sight for me so I snuck her a piece of ham from the kitchen. She started hanging around our backyard after that. Just a few days later we left on vacation and my dad said that if she was still there when we got back we could keep her. I remember coming home from vacation and jumping out of the car as soon as it came to a stop. As soon as I opened the back gate she came around the corner meowing up a storm. I was SO happy that she stayed. She was a little brat sometimes and wasn’t really a lover. She didn’t like to cuddle and was pretty rough when she played. But whenever I was sick she would jump on my bed and just watch me. Occasionally coming up to sniff whatever part of my body was out of the covers to make sure I was ok…the silent sentinel. She was about a year old when we got her and around 13 when she passed. I was out of the house by then but it still hit me really hard. She was such a good pet and we had just gotten her off the street as a stray. She is one of the reasons my husband and I have never purchased a pet. We have found all of our dogs at the local animal shelter (where we got my eventual tripawd JJ), rescue organizations, and even one was purchased with the rest of her litter from a homeless lady out of a duffle bag in a grocery store parking lot. Samantha taught me that you don’t have to spend a lot of money on a dog or cat to find a good pet. My childhood dog was a Golden Retriever named Princess. My absolute passion for dogs comes from my love of Princess. I was depressed and began drinking at 14. After many years of heavy drinking and almost losing my life to it, I decided to clean my act up. I went through rehab and attended AA meetings. About 2 years into sobriety I adopted a dog. Angel. Which is what she was, an Angel. Not because of how she acted, rather because she saved my life. She saved me from myself and helped me become a better person. Angel is a Tripawd that I got from a rescue. She had been abused by her first owner and as a result of her femur being broke 3 times by 10 months old, the vet had to amputate her leg. She has been my baby for almost 5 years now and I owe my life to her. There were days that because she was there, she was my reason for getting out of bed. I never let her down. I never missed feeding her or letting her out. I couldn’t go back to my old lifestyle because I knew if I did, I would fail her. I would not be there for her. I rescued her, but she saved me. Julianne & Amanda, thanks so much for sharing these very sweet stories! Amanda won the book but we’d like to send you a little “thanks” for taking time to share your story Julianne so stay tuned.